"From traveling with Fido to exploring St. Pete's finest museums, TradeWinds Island Resorts has a variety of vacation packages to spark everyone's interests. Vote for your favorite vacation package and enter to win your dream getaway!" 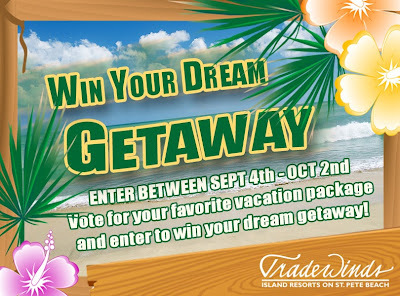 To enter all you have to do is like their Facebook Page, "vote" for your favorite vacation, and fill out your information. It is optional to share on your Facebook wall. Grand Prize: One vacation package of winner’s choice. Vacation package must be one of the six packages featured in the sweepstakes. Package will include all elements listed in description of package on the sweepstakes page. 3 nights in a Standard Pet Friendly Suite or Gulf View Pet Friendly Suite for up to 2 adults and 1 pet. Contest ends October 2, 2013.